PRODUCT DESCRIPTION: Liquid grass fertilizer which is able to get into the turf fast providing a quick source of nutrients for grass which is in need of food. Comes with it's own sprayer which attaches to your garden hose and is ready to go. 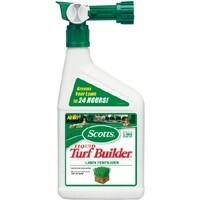 WHERE TO USE IT: On any yard you want to fertilize; for just about any type of grass. RATE OF APPLICATION: One quart will cover up to 5000 sq/ft. This will be enough to get it going but you may need to followup in 2-4 weeks depending on local conditions, how hungry your grass is and the need your turf has for food during the growing season. Remember, there are fixed amount of nutrients any one yard needs during the growing season and though this will give a boost for about 5000 of turf, I have seen very hungry yards which need twice as much to get them going! It is best to use this product and then get some slow release granular fertilizer put down right behind it so the grass will be getting a proper diet.